Happy Valentine’s Day to all of you who celebrate it. I have been working on creating some simple heart cards from felt and fabric in my pursuit of “using stuff up”. 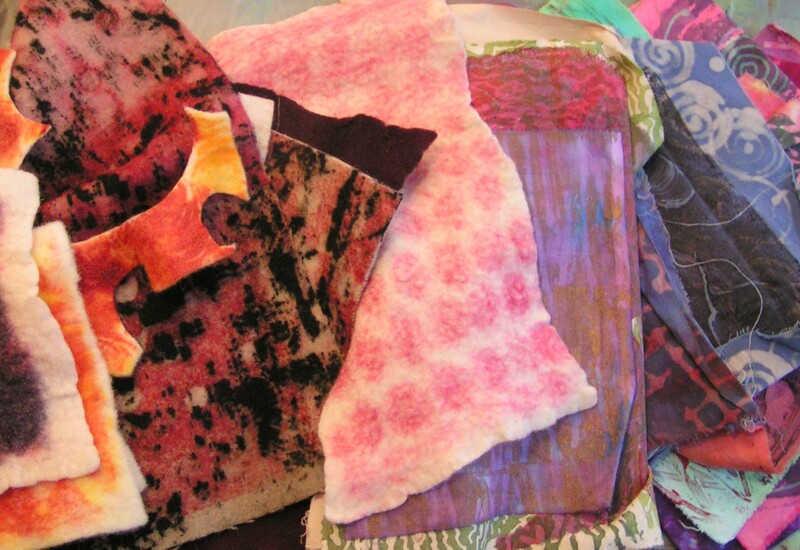 My stash includes hoards of printed felt and fabric. So I decided to combine the two with a bit of free motion machine stitching to make some Valentine’s Day cards to sell. I started with a pile of fabric from orange to purple. I thought it would be good to have some contrasting fabric for the hearts. First I cut out a stack of felt backgrounds that were the right size for my cards. The cards are smaller than I usually make and the pieces of felt were only 3 1/4″ x 5″. The photo on the right shows one of the pieces of felt sitting on the paper note card. Next I chose the fabric to go with the different colors of felt. I then put fusible web on the back of the fabric with the iron to give the fabric a bit of stiffness. I wanted to be able to free motion machine stitch hearts on without using a stabilizer and I hoped that the fusible would give enough stiffness. I ended up leaving the paper backing on, then stitching and then removing the paper backing. I then free motion machine stitched the cards. I was using white bobbin thread and didn’t have the tension exactly right but it’s good enough for me. The photo in the middle shows the back of the stitched fabric with a portion of the paper backing still in place. I removed all the paper backing and then cut out the hearts. Then I fused the hearts to the felt and fused the felt to the paper card. Fusible web sure does make things easier. And here are the cards after I finished fusing them all together. I put them in cellophane sleeves, luckily I had the right size although the envelope was a tight squeeze. Now they are at the store ready to be snapped up by customers (hopefully). Do you make cards for specific holidays? How do they sell for you if you sell them? Or do you just give them to friends and family? This entry was posted in Free Motion Stitching, Made From Felt, Repurpose, Surface Design and tagged felt and fabric heart cards, screen printed felt, surface design. Bookmark the permalink. Gorgeous cards, Ruth. Very lovely. I’m sure they will indeed be snapped up. Thanks Lindsay, the nice thing about hearts is they sell year round. So even if they don’t get snapped up right away, they’ll eventually sell. 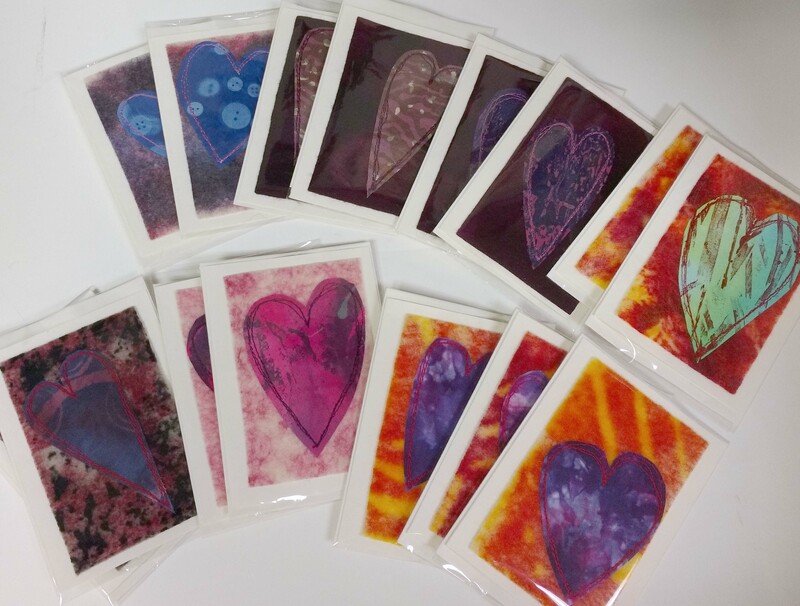 They’re all very pretty – really like the heart shapes you’ve used. They should sell – each card is unique, unlike those bought in a card-shop! I like your hart cards. Cards are on my to do list. although I was thinking of doing photos of other works. We don’t really use cards. when I buy them it is usually because I like the picture and will keep them. I have some up on my studio walls. Thanks Ann, I make cards for Dennis and other friends and family all the time. I sell quite a few too. These are beautiful Ruth, I am particularly drawn to the ice-blue heart on red/orange background, although it doesn’t say “love” or “valentine” to me I would love to have it a hanging on my wall as a piece of art. I do sometimes make cards to sell at craft fairs etc but found that I would easily spend an hour making each card and then find no one wants to pay more than £3 for them, not a great return on my time, I can earn more than twice that stacking shelves in a supermarket! But they are a great way to use up small scraps. Thanks Teri, I charge $8 for original cards. Still probably not worth the effort. I try to make them in batches to save on time. Forgot in my earlier comment to answer your question. I print photos of my large bird felted pictures which I stick onto cards. They sell well and aren’t too time consuming. Sometimes I make original felt to go on cards but I try to do them in batches – eg a piece of felt I can cut into strips – otherwise, as Terri says, you can’t charge enough for them to make it worthwhile. Funnily enough I have a batch of nuno felt pieces made with beautiful dyed silk on my dining table right now that I’ve been hand beading onto. I’ve enjoyed the evenings of slow stitching but can’t quite bring myself to stick them onto cards as they’ve taken a long time so am wondering about putting them into mini frames. Will post a photo on the forum when I have a chance (and daylight). That’s a good idea with your birds. I have considered printing original artwork on cards but haven’t done it yet. I think your beaded pieces sound like they should be framed. Lovely unique cards Ruth, and as you say hearts are not just for 14 Feb. I’m sure any recipients will be delighted. Simple but effective Ruth. Good idea not to label them as Valentine cards, as they can be used all year round. I made a stash of cards from scraps of leftover indigo and ecoprinted material but like Terri I find it tricky to sell them at a viable price. Thanks Kim, it is hard to sell one of a kind cards. The indigo ones sound nice. Happy Valentines Day! Lovely cards and great use of “stuff.” Even after today they could be used different ways – cheer someone up, tell them you love them or thinking of them at a good or bad time. Thanks Marilyn, Happy Valentine’s day to you too! How did they sell? I make greetings cards to sell at fairs, some with felt offcuts, which sell the best, but like Terri says, you don’t get what they’re worth. I also sell original acrylic paintings which I’ve attached to cards and prints too, anything from abstract digital designs to scans of ‘real’ paintings etc. Thanks Zed, sadly they didn’t sell at all. I think I will still sell them as hearts sell year round. How do your paintings sell? Yeah, they’re the kind of thing which will appeal all year, not just Valentine’s day. I’ve sold 1 or 2 acrylic ones. the felt ones sell better.